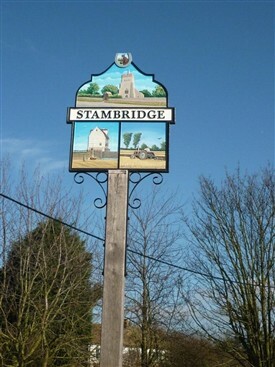 Stambridge had a very prestigious football team in the 1940s and 50s. They played on the field opposite on the Cherry Tree and were followed and supported by us all. Three of the Kilworth brothers played in the team (Joe, Fred and one other), as well as the Farthing family from Paglesham and Canewdon. I remember one of them was called Tim. Behind the football field was the field where Rankin's cricket team played, also followed and supported by everyone. On the same side as the Cherry Tree were a row of cottages where the Kilworth brothers and their sister Vera lived. Vera brought them up as there were no parents, but I cannot remember why. Incidentally, this family has no connection to Mr Kilworth (Old Rhubarb). Past the row of cottages on the opposite side of the road was a small white cottage where Mr and Mrs Smith lived. A large grapevine grew all over the front of their cottage and as boys we dared each other to go and scrump the grapes before Mr Smith caught us. This cottage has now been demolished. This page was added by Helen Barnard on 10/03/2011.